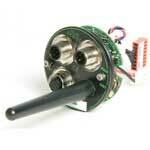 Wireless motor communications - it really makes sense! We Humans mostly move around freely and use wireless communications like speech and sight! We wouldn’t want to be wired up. How about using electrical motors in a similar way? 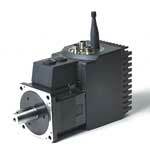 JVL offer a range of wireless interface modules for the MAC series of advanced servo motors. For many applications, wireless communications is superior to cabled solutions. This article discusses aspects of wireless versus cabled connections, and goes on to describe the different types of wireless interfaces with their merits and considerations. 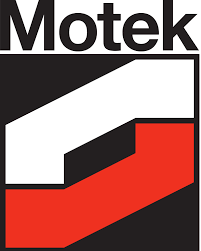 Why would you want to use wireless communications with your next motor? Imagine: No more broken cables, No more loose connections. Handheld remote control, Distributed intelligence, Save the environment. Why is wireless often more reliable than cabled connections? Because there are no cabled connections (*except for the power supply and optional local I/O). And loose connections are perhaps the number one reason for failure. Does your application really need all those cables to work? For large installations, with a central PLC or other computer controlling many motors, the savings on cabling can be very significant. One example is the rapidly growing sector of solar energy plants, where several thousand mirrors are focused to heat water in a tank. In applications like this, it’s obvious how many kilometers or miles of cables could be saved. Perhaps you’ve tried using wireless communications and found that it didn’t work reliably? There may be times when an object blocks the transmission, and there may be electrical disturbances. The good thing is that electrical disturbances tend to be temporary, and thus the connections are self-healing. You don’t need to send a service technician out to fix the air. The other thing is that you’ll need to handle these cases. This is why you’ll want to use Distributed Intelligence. Wireless communications is an open invitation to seriously consider using distributed intelligence. In fact, for many applications, it will be required because of the, at times, unpredictable transmission delays and retries, and sometimes timeouts. This is where JVLs nano-PLC concept comes in handy. The nano-PLC functionality built into every wireless interface module (and later in 2009 also available in the MAC400 and MAC800 firmwares) will allow you to program the behaviour in case the communication fails. Since there are several digital inputs and outputs available on the interface modules, you can write your own program to handle any situation locally. While at first sight this could sound like undesired extra work, JVL customers have found that using Distributed Intelligence save them time and money, and make for better overall products. In many cases, the analogue and digital inputs and outputs can eliminate the need for an expensive PLC and/or the cables to it. Imagine you’re a large-scale farmer and want your railed wagon to drive to several positions and dispense certain amounts of foods for your animals. This could be done with two wireless motors with distributed intelligence, one for the driving and one for dispensing. The wagon could even drive outside the wireless coverage, since the local intelligence could remember a long sequence of instructions and drive back after it has done its job. The central master controller would just have to wirelessly transfer the feeding plan and ask the wagon to start. It is very, very important to fully understand just how important the local intelligence is for reliable operations. With the easy-to-use graphical programming system for the wireless modules, most common errors can be handled well because I/O information is readily available. 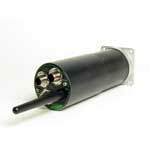 Servo motors are used increasingly to relieve workers from heavy, potentially damaging, lifts. Examples include baggage in airports and assistive technology for the elderly and disabled people. These are also areas where you don’t want people to stumble or be troubled by cables. Some wireless technologies, like ZigBee, have such low power consumption, that a set of batteries can last many years. The carrier here is simply thin air, that doesn’t wear out like cables do. And it’s already here — so no need to load the environment with all the cobber and plastics or rubber for the long cables. Just compare the manufacturing resources of the small antennas to the manufacturing resources of long, thick cables. The combination of Wireless Communications and Distributed Intelligence may be a better solution for you and the rest of the world in the long run. When deterministic behaviour is critical or centralized intelligence is required, a good fieldbus, like CANopen, DeviceNet, Profibus or RS485 may be a better choice. Also for environments with high levels of electrical disturbance, shielded cables may work better. Which type of wireless connection is right for you? The MAC00-FBx interface modules use the BlueTooth protocol. This is the simplest and most standardized protocol and it has matured over the years by being used in cell/mobile phones and with PCs. Many of us have tried to buy an inexpensive USB to BlueTooth adapter and found we could easily search for other BT devices in range, and go on to create a virtual Serial Communications Port, like COM9. BlueTooth is the natural choice for small installations with up to seven motors that are within the range of approximately 10 meters from the master device. 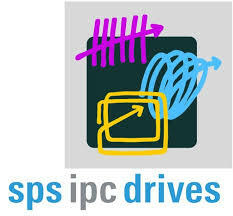 Suitable Remote Controls or cell/mobile phones with small Java applets can be used as masters. An example is for lifting heavy objects like suitcases in airports. A BlueTooth remote control with an Up and a Down button could control a motor with a hook at the end of a wire to do the heavy lifting. The MAC00-EWx interface modules use the WLAN technology known from home or office computer networks. This technology is far more advanced than BlueTooth, and supports a much higher number of motors, actually several millions on a single network. It can be configured to work with most existing WLAN installations, and supports strong encryption, DHCP and many other well-known technologies. Remote diagnostics and control can be performed over the existing in-house Ethernet, and it would even be possible to connect to a motor over the public Internet with appropriate standard equipment. Third-party PC applications can generate a virtual Communications Port, like with BlueTooth, or for larger installations, where you wouldn’t want to have several hundred COM ports, an small IP utility can be used, so programs can use much more direct communications. The complexity of WLAN setup and maintenance means it is well suited for organizations with in-house IT knowledge. These people also know that it can sometimes be challenging to make equipment from different manufacturers work well together, since the WLAN standards have evolved rapidly over the years. If you don’t need the capabilities of WLAN, one of the other wireless technologies may be a better choice for production. Some of JVLs customers start out with using WLAN during development, and then later switch to one of the other, simpler wireless technologies that fit the final product. The JVL MAC00-FZx interface modules are based on the radio communications standard called IEEE 802.15.4. This standard can be downloaded free of charge from http://standards.ieee.org/getieee802/802.15.html where various versions are available as PDF documents. In most cases, users will not need to read these fairly technical standards to use the MAC00-FZx modules. In summary, this radio standard can use 12 different radio frequencies called channels to control up to 12 individual networks in the range of a few hundred meters. The standard describes three frequency bands, where the one used by the MAC00-FZx modules is the 2.4GHz band, usable in almost all countries without requiring a registered license. The data bandwidth is relatively low, theoretical maximum of a few hundred kilobits per second, but with most protocols, only about 20 kilobits per second can be used. This is fully intentional, since the 820.25.4 was designed as a Low-Rate technology for tasks like building automation, where ultra low power consumption is important for battery operation, while the speed to turn lights on and off or to start a motor movement is less critical. The standard MAC00-FZx modules use a proprietary software communications protocol on top of the 802.15.4 radio standard. This protocol is optimized for fast and reliable serial communications between exactly two nodes, typically one MAC motor with an MAC00-FZx module as a server node and a PC or PLC as a Client node. It is possible for the client to switch from one server to another by identifying it with a unique 64-bit number. It is possible to install additional firmware to use a higher layer protocol called ZigBee, which can be a very good choice for Mesh Networking. A mesh network looks much like a spiders web or a fishermans net. The data traffic can travel in many routes through a mesh network and can automatically find its way through one or more nodes from the client to the destination node. Also if the network is changed, or some of the nodes are unavailable, the network can be self-healing by changing traffic routes, and is thus much more robust than a network with static routes from the client to the destination node. With mesh networking, data from the first node can reach any other node regardless of the distance as long as there are enough radios in between to pass the message along. 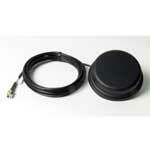 This can reduce the cost and installation challenges of antennas. Several very large companies stand behind the ZigBee protocol and they are members of The ZigBee Alliance. Learn more about ZigBee on http://www.zigbee.org/ where the specification can also be downloaded for free. 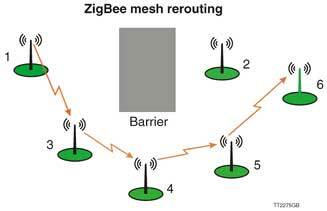 ZigBee is used extensively for wireless building automation. The cost of a complete ZigBee IC is now below 1 USD in production quantities. Several other protocols also use the IEEE 802.15.x as a basis. Read also this article: The Wireless Revolution: Transforming Industrial Networking. Point to point 0.5 sec. 1) You can have many access points and thereby have up to 65535 units. 2) With a good master antenna and line of sight.